With more than two decades of experience building Custom Bathrooms, we at Wesley Johnson Masonry Company have worked on many custom masonry projects for bathrooms in the Branson, Springfield and Greene, Taney and Stone counties. Specializing in brick, stone and block, our company would be quite pleased to build you the bathroom of your dreams! 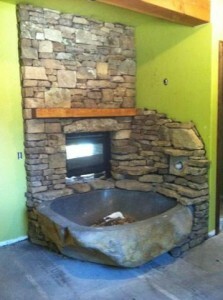 Although many people have probably not considered using stone, brick or block to accent or decorate their bathroom, over the last decade this form of custom masonry has become increasingly popular in the Branson, Springfield and Greene, Taney and Stone counties as well as the rest of the country. It provides a completely unique design for your home and certainly sets it apart from your neighbors’ residences. Please view examples of our work to see just what a unique option a custom bathroom using masonry can be and feel free to call us at 417.339.7689. We would love to hear any ideas you may have or answer any questions about our services in regards to custom masonry bathrooms in the Branson, Springfield and Greene, Taney and Stone counties.